This is the continuation of the previous post. "Although it was not considered much of a hit in Russia The Nutcracker kept being performed throughout the theatre year (at that time it was not yet heavily associated with the Christmas season). In the West, however, it boomed... in scattered pieces, with the Arabian dance transplanted [for Diaghilev] into the Ballets Russes’s Sleeping Princess and with Anna Pavlova‘s take on The Waltz of the Snowflakes. "The first complete Nutcracker was staged in London by the Vic-Wells Ballet in 1934, based on choreographic notation by Nicholas Sergeyev." Sergeyev was a former dancer and stage manager at the Mariinsky who'd emigrated in 1918. The transcription of this and other ballets into systematic choreographic notations constitutes yet another example of intersemiotic translation, but we won't dwell on it here. "Ten years later saw the first US version by San Francisco Ballet (1944) and another ten years brought George Balanchine’s blockbusting version for NYCB (1954), now staged every year by several US ballet companies. By the 1980s, 300 separate productions were touring the US." Balanchine was another Russian émigré, who, like Sergeyev, knew Nutcracker from his younger days at the Mariinsky and stayed close to the original, although he did make changes because he was himself very creative. Indeed his greatest creation was his dance company, the New York City Ballet (NYCB), which has had a great influence on ballet in the United States. His is an example of the contribution that the flight of Russian artists after the Revolution made to the transfer and implanting of Russian culture in the West. Meanwhile, the music that Tchaikovsky had extracted from the full ballet score to form an orchestral suite made its own successful way through the concert halls on both sides of the Atlantic. And then, in the United States, it underwent yet another surprising intersemiotic transfer. Between 1938 and 1940, Walt Disney and his team of graphic artists made the animated film Fantasia, and it included the Nutcracker Suite. It was among the most original and pioneering films of all times for a number of innovations: the use of classical music as the basis (music film instead of film music), the recording thereof by a first-class orchestra and conductor using the best audio available at the time (it was the first American film to use stereo), its uncompromising concert length (there was a 15-minute interval when I saw it), its combination of animated and human actors, use of the most advanced animation resources in the world, and above all the free rein given to the graphic artists. "During production, the animators were given no instructions for coloring. Walt Disney instructed them to use any colors they wanted, a first." I was lucky enough to see Fantasia during its 1941 first release, before cuts and restorations and with the original soundtrack recorded by The Philadelphia Orchestra conducted by Leopold Stokowski. Despite his Russian-sounding professional name, Stokowski himself might be considered a cultural export to the USA, since he was born Leonard Stokes in London, England. He threw himself into the project, and the result was phenomenal. Like many masterpieces, Fantasia is uneven, but at its peaks it's brilliant. For very young children, there's no doubt that its most brilliant idea of all was the casting of Micky Mouse as The Sorcerer's Apprentice. But the film was mainly pitched at older children and at adults. And that's where the music of Nutcracker came in. 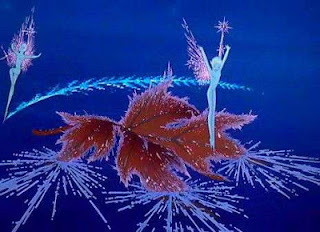 Fantasia was released four years before the American premiere of the ballet, yet in the visuals of Nutcracker there is clear ballet influence. "Over the decades, much has been written about the relationship between Disney and dance. My own mental accompaniment to the music of Nutcracker was formed and imprinted indelibly by Fantasia long before I saw the ballet or read the story. Alexandre Dumas. Princess Pirlipatine and the Nutcracker. Translated and adapted from Dumas' version of Hoffman's story by O. Eliphaz Keat (pseudonym of Philip Bertram Murray Allan). London, 1919. With illustrations. The British Library has a copy. Nicholas Sergeyev. Encylcopaedia Britannica, here. 'Emilia'. The Nutcracker. The Ballet Bag, 2009. This very complete article is here. There are full details and many comments on Fantasia at the International Movie Database (IMDb) site. Click here. 'Storyboard'. Fantasia in eight parts: The Nutcracker Suite. The Walt Disney Family Album, 2012. The article is here. From The Nutcracker Suite sequence in Fantasia. Source: cornel1801. – through translation, adaptation and changes of media – as typical Christmas entertainment for children and adults on the British popular stage. The first was The Thousand and One Nights, a collection of Arabic folk tales from whose French translation the pantomime Aladdin and His Wonderful Lamp is descended. To find it, enter aladdin in the Search box on the right. Then came another pantomime, Cinderella, the story line of which had been written in 18th-century France (enter cinderella). Last year, the outcome wasn't a pantomime but a favourite Christmas ballet, Sleeping Beauty (enter sleeping beauty). This year we continue in the ballet genre with the great rival of Sleeping Beauty for Christmas audiences in the United States as well as in Britain: The Nutcracker. The story in this case was written by the German Romantic author of fantastic tales, E T A Hoffman. "In 1816 Hoffman published Nutcracker and the Mouse King (Nussknacker und Mäusekönig). Based in part on his own life experiences – he had built a cardboard castle in 1815, just as Godpapa Drosselmeier does in the story – Hoffman published the story in a children’s Christmas book. Hoffman and his friends did not consider The Nutcracker entirely a success." But they were wrong. It was a golden age for fairy stories and folk tales in German culture. Indeed Germany is currently celebrating the first publication, in time for Christmas 1812, of the Grimm brothers' Die Kinder- und Hausmärchen (Children's and Household Tales). The transfer to French and to France came about in 1844 in the version by no less an author than Alexandre Dumas père (he of The Three Musketeers). He gave it the title Histoire d'un casse-noisette and his popularity ensured its success there. Why Dumas? "Alexandre Dumas was a born storyteller. So writing a tale for children was bound to attract him and in fact he wrote several. What's more, he constantly sought inspiration in the popular culture of the countries and regions he visited and in the folk tale genre." "Dumas explains how he was obliged, at a children's party one evening where his daughter had been invited, to tell an impromptu story to the little rascals – who had tied him to his armchair while he was snoozing." It was Dumas' version that was eventually to provide the script for the ballet. Switch now to late Czarist Russia. Ivan Vsevolozhsky, the enterprising impresario of the Imperial Mariinsky Theatre in St Petersburg, was looking for a worthy follow-up to the success of Sleeping Beauty. So he thought of Histoire d'un casse-noisette and he turned again to Marius Petipa for the choreography and to Tchaikovsky for the music. It's not necessary to posit a Russian translation of the story: like all the Russian elite of the period, Vsevolozhsky and his collaborators knew French, and furthermore he himself had spent time as a diplomat in Paris. Petipa adapted the story for its intersemiotic translation (i.e., transfer between media) to the dance and the stage, and gave strict instructions to the composer, even specifying the number of bars for each dance. This irked Tchaikovsky, who nevertheless delivered the sublimely elegant music that has become so familiar. Tchaikovsky in return imposed his own conditions – but that's another story. Vsevolozhsky again contributed costume and decor designs. Meanwhile Petipa fell ill and had to be replaced by his assistant, Lev Ivanov, who therefore did most of the choreography. 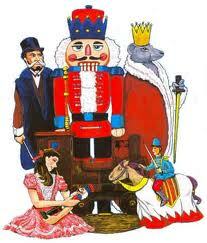 In the event, Nutcracker didn't enjoy the same success as Sleeping Beauty. Only extracts were included in the Diaghilev repertoire. Some people said the it was too childish for adult audiences. Some critics considered the music "too symphonic". However, Tchaikovsky turned this latter to his advantage by distilling from the score the orchestral suite that is performed far more often than the ballet, and thus caused another change of medium in yet another part of the world – more about this later. Introduction. In E. F. Blieler, ed., The Best Tales of Hoffman, New York, Dover, 1967. The full German text of the Hoffman story is available here. Kate Connolly. Grimm's Fairy Tales: 200th anniversary triggers a year of celebration. Guardian Unlimited, 20 December 2012. The article is here. Delphine Dubois. Histoire d'un casse-noisette. Alexandre Dumas: deux siècles de littérature vivante. Société des Amis d'Alexandre Dumas. The article is here. The full French text of Dumas' version is available here. 'Emilia'. The Nutcracker. The Ballet Bag, 2009. The article is here. It contains an English synopsis of the story. The principal characters in the story. Source: Seiskaya Ballet. Royal Ballet. The Nutcracker. Video, Royal Opera House, Covent Garden, 2009, approx. 2 hours. It's here, with a modern adaptation of Lev Ivanov's choreography, but only for this week. It's rare for interpreters to be honored for their work. In Zagreb I did once meet Dr. Vladimir Ivir, who was proud of the MVO (Member of the Royal Victorian Order) that Queen Elizabeth II had bestowed on him for his services when she visited what was in those days Yugoslavia. But then he was a Professional Expert. "Rangers scout Joe Furukawa, who worked this year as the interpreter for Texas Rangers right-hander Yu Darvish, on Wednesday was named the 2012 Harold McKinney Good Guy Award winner by the Dallas-Forth Worth chapter of the Baseball Writers' Association of America. 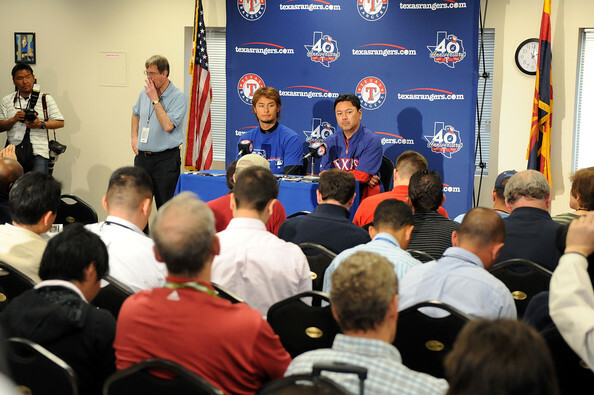 "Furukawa, a Pacific Rim international scout for the Rangers, served as Darvish's interpreter for all press conferences and media liaisons in the Japanese pitcher's first season in the majors. Furukawa played for the Hiroshima Carp and Yokohama BayStars. "Furukawa will receive his award along with Rookie of the Year Darvish, Player of the Year Adrian Beltre, and Pitcher of the Year Matt Harrison, at the 2013 Texas Rangers Dr. Pepper Awards Show, which will be held in conjunction with the Texas Rangers Fan Fest at the Arlington Convention Center on Jan. 11." Should be quite an event. Joe is a Professional Expert Baseball Player, but there's no suggestion he ever had any training as an interpreter. He must be good at it. He was an early bilingual. "He was born in Yokahama, Japan, but moved to Anaheim, Calif., when he was six years old. Furukawa still has family – his parents, brother and sister – who reside in the United States. "Furukawa doesn't just speak English and Japanese – he speaks the language of baseball. He played in Japan, spending much of his career as a minor-league shortstop, and understands the culture and how the game is played there." Clearly baseball is something which goes against the "offsprings of The Chrysanthemum and the Sword" vision of Japan that Lionel Dersot decries. "We're the envy of 29 teams who would love to have a guy like him," said Jim Colburn, senior advisor for Pacific Rim Operations and the point person on the club's expansion to that market the last few years. "He's a fanatic about baseball. Any scout that goes to Japan knows who he is. It's very important for a Japanese player to have an eloquent interpreter. The English that comes out of Joe's mouth is sensitive and correct. That's what he brings to the table." Kyodo News Agency. BBWAA honors Darvish's interpreter. Japan Times Online, December 14, 2012. The report is here. Richard Durrett. Joe Furukawa speaks baseball. ESPN Dallas/Fort Worth, April 9, 2012. The article is here. It provides insight into how valuable this kind of liaison interpreting is. Yu Darvish #11 of the Texas Rangers talks to the media with the assistance of his interpreter Joe Furukawa after spring workouts at Surprise Stadium on February 23, 2012 in Surprise, Arizona. Source: Norm Hall/Getty Images North America. This is the continuation of the November 24 post. 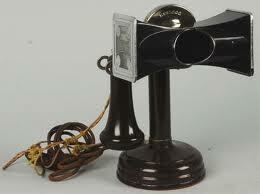 Simultaneous interpreting (SI) as we know it today was invented in the 1920s. The idea came from an American department store magnate turned philanthropist, Edward Filene (1860-1937), part-owner of Filene's in Boston, Mass. He was a supporter of the then newly established League of Nations, forerunner of the United Nations. How did he come to be involved in international affairs at time when the USA was tending to isolationism and had refused to join the League? It helps perhaps to understand his interest if we know that, although he was American, his parents were immigrants from Germany and he eventually died in Paris. "Edward Filene drew inspiration from the scientific management ideas of Frederick Winslow Taylor... Taylor is best known for the use of scientific methods to increase workplace efficiency." His penchant for scientific workplace methods was to prove significant for interpreting. "The interpreter's booth will be provided with an ordinary telephone desk stand on which is mounted a high quality close talking microphone which will be connected through another amplifier to a number of head sets located at a designated section of the auditorium. The translated speech of each interpreter would follow simultaneously with the delivery of the original speech." Filene had a brilliant idea but he wasn't an engineer. 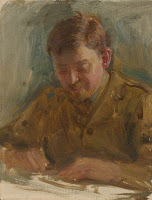 So he enlisted the collaboration of a British electrical engineer, A. Gordon-Finlay (often wrongly written Gordon Finlay or Findlay) who was working in Geneva. Gordon-Finlay put together a system from telephone equipment of the period; for which reason SI was for many years called telephone interpreting. The original Filene-Finlay system was taken up and further developed by IBM's legendary founder, Thomas Watson Sr. Like Filene, Watson had an eye to the favourable publicity that a contribution to international understanding might generate (see the Berkley reference below). In fact the technical side of SI was not completed by the IBM Filene-Finlay system. There was another element that's often overlooked. This was the soundproof cabin (or booth as the Professionals call it) with its large glass window facing the speakers' platform. There are photos of early booths at Geneva for the IBM system, but later at Nuremberg (see below) there were only glass side partitions between the interpreters' desks; the latter were open at the front and therefore far from soundproof. They can be seen in the photos of the Nuremberg courtroom. Not until fully soundproof booths were installed for the United Nations in New York, two decades after Filene-Finlay, did they become universal and the interpreters could speak at normal volume without fear of disturbing the people around them. Meanwhile they either had to speak very quietly into their microphones or else use another sound-dampening device that had just recently come on the market in the USA in 1921: the Hush-A-Phone (often wrongly written Hushaphone). For a description, see the YouTube Reference below. SI was used at Geneva and in the Soviet Union through the 1930s, but only sporadically before it emerged supreme at the Nuremberg Trials after World War II – thanks to the vision of another American with a European background and a bent for technology, Léon Dostert. But that's another story. Something that long puzzled me was how Filene and others came to think of SI and believe that the formidable triple mental process of listening, translating and speaking was possible. (In fact, there were staff at the League who did not think it possible, and Filene's initial proposal was for the interpreting to be done from shorthand notes.) I have a suggestion. It harks back to the definition of whispering at the start of the previous post. It's that some people thought it could be done and were willing to try it because they were aware it already existed without equipment in the primitive, natural form of whispering and murmuring. There's a Wikipedia biography of Edward Filene here. Filene's Department Store was merged with Macy's in 2006. Jesús Baigorri Jalón (University of Salamanca, Spain). La interpretación de conferencias, el nacimiento de una profesión: de París a Nuremberg [Conference interpreting, the birth of a profession: from Paris to Nuremberg]. Preface by Jean Delisle. Albolote (Granada): Comares, 2000. 344 p. This is the standard history. There's a French translation by Clara Foz: see here. Jesús Baigorri Jalón. Back to the Future. PowerPoint presentation to the Brussels 15th DG-Universities Conference. This gives the essence of the story in English. Read it here. Francesca Gaiba. The Origins of Simultaneous Interpretation: The Nuremberg Trial. Ottawa: University of Ottawa Press, 1998. 190 p. Based on extensive archival research and on interviews with surviving interpreters. Available on paper or as a PDF ebook: see here. There's a review of it by Baigorri Jalón here. American Museum of Radio and Electricity. The Hush-A-Phone. A brief YouTube video, viewable here. George E. Berkley. The Filenes. Boston MA: Brandon Publishing, 1998. This book has an interesting page or two (p. 203f.) on the IBM patent and the relationship between Edward Filene and Thomas Watson. It’s available here.